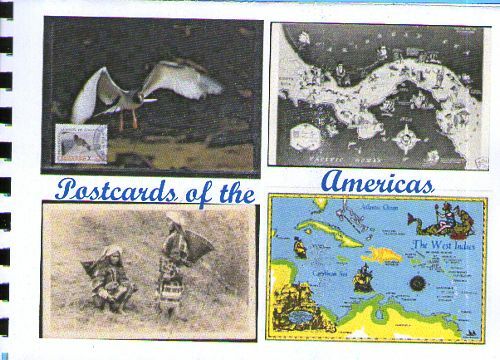 This is a journal of Postcards of the Caribbean Islands, Mexico, Central & South America. They were amongst a box of some 60 years of postcards collected by members of my family. You can write, draw or comment on any of the postcards. Use the page facing the postcard. I did not have many postcards of this area so there are blank spaces where you may insert a postcard of your own too. From time to time I will mooch it back. Please help me get a mental picture of this region! Please make sure you relist by the number shown opposite within two weeks of receipt, and whilst being prepared to send onwards promptly, only accept requests for journals from friends of the journal library. If your moocher is unknown to you, please check that they understand what journalling is and will keep journals circulating. the Bookmooch Journal Library Maintainer bmjl: (Heard and McDonald Islands). Click on the blue underlined link in the journal description to see the slideshow. This book is inspired by an ad I saw for a new book, “Forgotten Bookmarks” by Michael Popek, who is a bookseller who shares what he finds forgotten between the pages of books in his shop. I’m sure we’ve all found something like this, a receipt, ticket, or shopping list, or even an actual bookmark holding a place in a book we picked up at the library or a used booksale. This journal is for us to share what we have found. Please attach the item you found in the journal, and tell us a little bit about what book you found it in, and where you found the book. If you’ve found more than one object, feel free to use as many pages as you like, but please be sure not to alter other’s entries. If your entry fills the book, or it is damaged and needs repairs, Please contact me (carlyexactly) and I will mooch this book from you. Please relist and be ready to resend the book within two weeks of receiving it. Thank you for you’re interest and participation in this project! 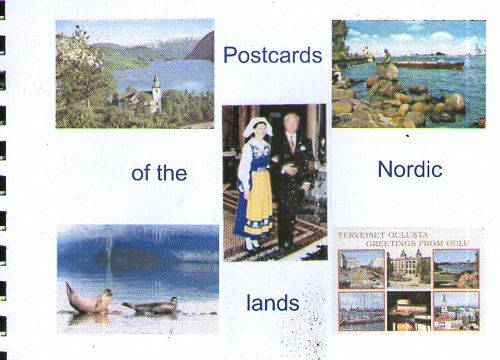 Postcards of Nordic Lands: Denmark, Finland, Iceland, Norway, Sweden & territories. This journal is composed of Postcards of the Nordic lands: Denmark, Finland, Iceland, Norway, Sweden and their territories the Faroe Islands, Greenland and Åland. The postcards were from a box of some 60 years of postcards collected by members of my family. You can write, draw or comment on any of the postcards. Use the page facing the postcard. I have left a few blank spaces where you may insert a postcard of your own. From time to time I will mooch the journal back and rebind it to include a few extra added postcards. If many are added I may add a second volume later. Please make sure you relist by the number shown opposite within two weeks of receipt, and whilst being prepared to send onwards promptly, only accept requests for journals from friends of the journal library (bmjl). If your moocher is unknown to you, please check that they understand what journalling is and will keep journals circulating. the Bookmooch Journal Library Maintainer, bmjl: (Heard and McDonald Islands). 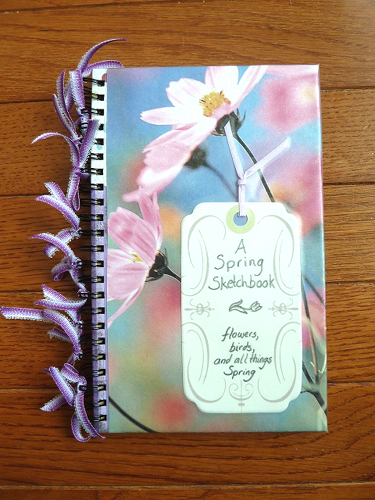 Description: Draw anything you like in this book that represents what Spring is to you. To me, I anticipate Spring throughout winter, and can’t wait until there is life outside again. Please try to refrain from printing out pictures and pasting them in, it doesn’t matter what you’re entry looks like or how badly you think you draw- we’d still love to see it! If you are really uncomfortable with this, you can always trace a picture, or just tell us about one of your Spring memories. Please do not alter other’s entries. The paper is a little thin, so if you are using markers or pens that might bleed through, please make sure there are no entries on the other side of your page, and use the piece of cardboard provided to protect the page behind it. The only other rule is- have fun! And use as many pages as you like! If your entry fills the book, or it is damaged and needs repairs, Please contact me (carlyexactly) and I will mooch this book from you. Please relist and be ready to resend the book within two weeks of receiving it. Please also feel free to have your friends make entries while you have the book- but don’t loose it! 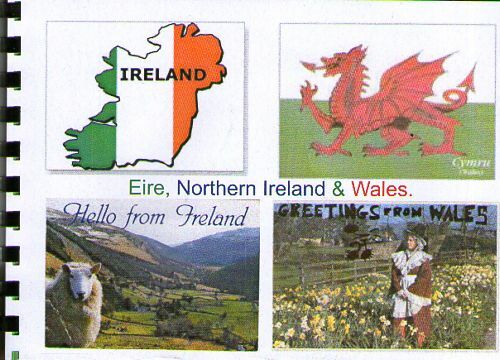 Postcards of Britain: Eire, Northern Ireland & Wales. This is the seventh of seven journals of Postcards of Great Britain and Northern Ireland. This one is for postcards of Eire, Northern Ireland and Wales – Celtic nations of the Western fringe of Britain. The postcards were mainly from amongst a box of some 60 years of postcards collected by members of my family. You can write, draw or comment on any of the postcards. Use the page facing the postcard. I have left a few blank spaces where you may insert a postcard of your own. From time to time I will mooch the journal back and rebind it to include a few extra added postcards. If many are added I may add a second volume later. 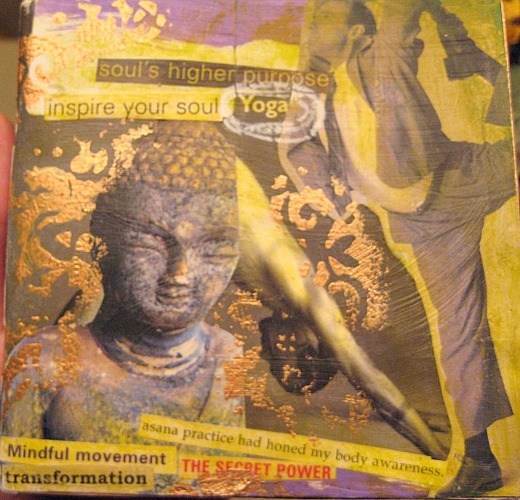 This yoga-themed booklet was also one of the 1001 Journals. It returned home to me and is now ready to navigate through the Bookmooch community. Anything yoga-themed goes. Please do as many pages as you like, responding to the images and text already in the book. Please do not alter someone else’s work, unless it is a page with just a glued in headline…then you can just go for it! Unfortunately this journal seems to have been kept by an inactive moocher, who marked it as sent, and all attempts to recover it so far have failed. Have you ever been bullied? Has your child or siblings been bullied? There are all types of bullying – school, job, cyber, etc. It seems to be getting worse & worse. Sometimes the bullies leave permanent scars. Or are you a bully who really regrets what you have done? Share your stories. Use as many pages as you need. Do not alter anyone else’s contributions. 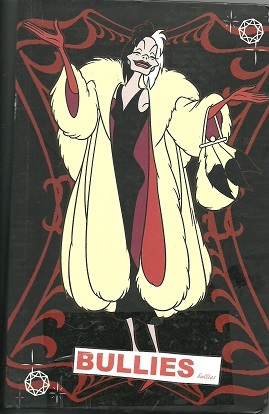 Only mooch on bookmooch, please make sure that the person that you send it to is a journaler or if new to journals make sure they understand how journals work. Relist within two weeks. When full, return to DRWS.